After Friday's big day skiing Clear Creek and Wintun Glacier on Shasta, I planned to head south and ski Lassen. But first, I really needed a day off and so I took the scenic route to Lassen on Saturday, driving via Medicine Lake, Surprise Valley, Black Rock Desert, and Pyramid Lake in NE California and NW Nevada (a very scenic and highly recommended loop). I left Pyramid Lake at sunset and reached the Lassen summit trailhead around midnight, at 8500 ft there was still 8-10 ft of snow around the parking lot. Although it was calm at the lot, I could hear the winds roaring overhead through the clear starry night. The next morning, sunrise brought a view of a lenticular cloud rapidly streaming past the summit, winds at least 50-60 mph. Since the forecast called for the winds to decrease during the day, I decided to wait it out and drove around to the Devastated Area (12 miles) to scout out the steep ski descent of the NE Face. Conditions looked good, with continuous snow above about 7500 ft. Although I'd have to hitchhike back if I skied the NE face, the thought of over 3000 vft of descent for only 2000 ft of climbing via the summit trail was too good to resist. While I was hiking the short Devastated Area interpretive trail, the lenticular cloud began to rapidly dissipate as the winds died down. So I drove back around and headed up the Lassen Peak trail just before 10am, deciding to forgo skinning and just boot up. Numerous other skiers and boarders were ahead of and behind me on the trail, which was only about 50% snowcovered, and the 10457 ft summit was quickly reached by 11:30am. Winds were gusty along the trail but no longer severe, never over 20-30 mph, and it was nearly calm at the summit. A look down the NE Face revealed a couple of skiers a few hundred feet down, waiting a long time for their third partner to summit and ski down. Looking farther down and left revealed the usual snow finger reaching down a gully near Crescent Crater, providing a ski out close to the park road. The snow was getting soft, so I didn't linger at the top and soon skied down the 48-50 degree pitch from the summit block. The snow was heavy and dense, already a bit too soft on the NE aspect which gets direct sun right from sunrise. So I angled right to the East Ridge to reach a more northerly facing aspect, which had nearly 2000 vft of nice corn down to 8200 ft. The snow softened again on the flatter slopes at the base of the NE Face, and angling far to the left brought me to the head of my intended exit gully near 7900 ft. The snow in the gully was firmer, and a quick schuss led me farther and farther down the gully. The snow finger in the bottom of the gully narrowed to only 15-20 ft wide as I neared 7000 ft, with a couple sections only a few feet wide and rushing water occasionally seen and heard near openings. Surprisingly I skied all the way down to 6900 ft where the snow suddenly ended in the outrushing stream, a total descent of over 3500 vft from the summit. The 1/2 mile hike out to the park road took only 15 minutes through the open forest, followed by a quick jaunt over the Devastated Area parking lot. Traffic was sparse, but after 15 minutes of thumbing, a nice couple from Mount Shasta City, Todd and Cynthia, gave me a ride back to the summit trailhead. Turns out they're skiers too, and so we talked about skiing on Shasta and the Cascade volcanoes and my upcoming book the whole ride back. Overall, it was a short but very pleasant ski day at the southern end of the Cascade Range. The NE Face should provide a fine ski run for several more weeks, while the SE Face was starting to look somewhat rough and dirty. 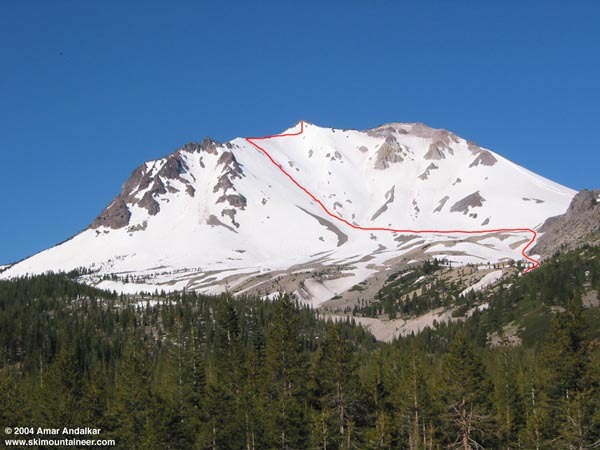 This photo shows the NE face of Lassen Peak from the Devastated Area, with my ski descent route shown in red. The summit trail is on the opposite side of the mountain. Click here for an enlarged version of this photo.